The history of SS Shieldhall, now based at Berth 48, Eastern Docks, Southampton, is well documented. Originally serving as a ‘Clyde Banana Boat’ carrying a cargo of treated sludge, she was sold in 1977 to fulfil a similar role for Southern Water, but was withdrawn in 1985 and laid up pending disposal and possible scrapping. The Southampton University Industrial Archaeology Group (now the Hampshire IA Society) drew the attention of the City Council to the ship and a public meeting was called, leading to the creation of a charity preservation group, The Solent Steam Packet Limited. Three years later the charity had raised the £20,000 required to purchase the ship, and Shieldhall was transferred to her new owners on 28 July 1988. Move forward 25 years to the day and many of the charity’s original ‘Founding members’ were on board (some with original share certificates and prospectuses) to enjoy a 5hr anniversary Solent Cruise. Live music was provided from the Shieldhall Stompers Jazz band, which included Founder Member Tony Purse. Chief Engineer for the day was Norman Tulip, another Founder Member. A great time was had by all, with a feeling of anticipation and excitement that the recent HLF Lottery Grant should result in a ‘Golden Anniversary’ cruise in 25 years time! 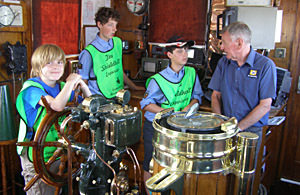 The £1.4 million lottery grant – awarded earlier this year – has given the Shieldhall crew another great reason to celebrate, and also enabled the staging of two ‘Young Persons Days’ on board in June and July, where teams of scouts and sea cadets learnt seamanship skills under the watchful eye of Training Officer Richard Jarvis and Vice-President Sir Robin Knox-Johnston. Activities undertaken during the training days included learning the duties of the Officer Of the Watch, how a ship is steered, compass, radar, communications, weather and signals; chart work and how to plot a course; heaving a line and how to handle heavy mooring ropes. A rescue RIB was launched whilst participants were taught about boat safety and how to steer a Fig.8 course, whilst down aft attention was paid to fire hazards on ship, the different types of extinguishers and an opportunity given to run-out hoses. As if this were not enough, all involved were given a full tour of the ships main machinery spaces where they were shown how steam is raised and used to power the ships two mighty triple expansion engines and the many essential auxiliary engines set about. The last Shieldhall cruise of the 2013 season takes place on Sat 7 September when she cruises the Solent for Merchant Navy Day, with a wreath-laying ceremony and remembrance service on board. The SS Waverley will also be cruising that day and close to Shieldhall, affording a rare photographic opportunity. Shieldhall will also be open for visitors on the Heritage Open Days Weekend (which coincides with the Southampton Boat Show) on Saturday 14th and Sunday 15th September, between 10am-4pm.